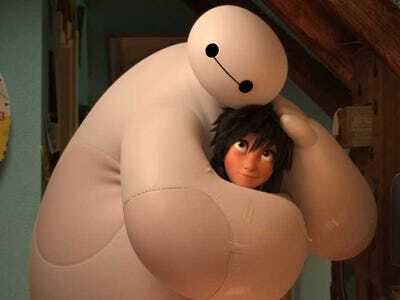 Warning: If you haven’t seen “Big Hero 6,” there are spoilers ahead. 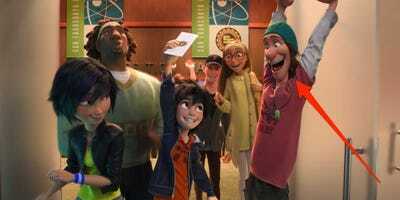 If you’ve seen Disney’s latest animated picture “Big Hero 6,” you most likely missed out on one of the best parts of the film without even knowing it. There’s an end-credits scene following the movie featuring a big cameo, but barely anyone seems to know to stick around for it. By now, Marvel fans know that any of Disney and Marvel’s superhero movies have an end–credits scene hinting at future sequels. But since this was an animated Marvel movie from Disney Animation, it wasn’t clear whether or not there would be an additional scene afterward. Parents may have noticed early on in the film that when Fred (T.J. Miller) walks his friends through his home, he stops at a family portrait showing his parents. Staring us straight in the face is an animated Stan Lee! That wasn’t where the cameo ended. After the credits, we see Fred return to the portrait, wishing his parents were around more. As he leans on the picture, he reveals a secret passageway. Inside is what looks like a superhero lair filled with costumes and gadgets. Stan Lee then appears and tells Fred they have a lot to discuss. The end-credits sequence plays out a lot like the scene from “Spider-Man 2” where Harry Osborn (James Franco) discovers his father (Willem Dafoe) is the Green Goblin. In “Big Hero 6,” it looks like Stan the Man and his son may combine forces to be a superhero team. We’ll have to wait and see whether or not that actually happens. During a panel discussion and screening of the film in Beverly Hills, the directors discussed how only a handful of people knew about the cameo. “We kept that a secret from everyone involved in the production, except for a very small team sworn to secrecy,” said producer Ray Conli.